Not too far from our cabin, on approximately 280 acres in the Arizona White Mountains, there is a dairy farm producing some rather delicious goat cheese and decadent chocolates. Black Mesa Ranch is known for it's cheese; but what many people don't know is that when the weather cools off it's time for owner, David Heninger to start creating chocolates and other confections. 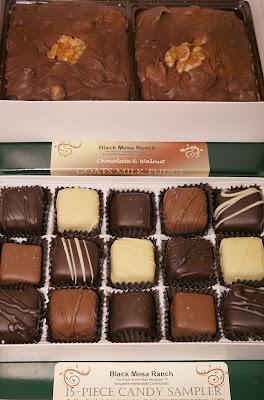 Exquisite chocolate, like the made from scratch goat milk fudge with walnuts, is a must try; and the Arizona grown spiced pecans should not be missed either. New this year are the handcrafted crystal clear jellies enrobed in Belgium chocolate. Three delicious flavors to choose from; one better than the next. Black Mesa Ranch, the only certified goat dairy in the state, typically has approximately 50 Nubian goats at any given time. The Nubian bread are known for their adaptability to hot environments; which is great for the Arizona summers. They also produce milk that contains one of the highest percentage of butter fat; making for a tasty cheese. Moderately hard and crumbly the goat milk feta I sampled had a nice salty bite to it. Perfect as a cheese board selection or mixed in salads; it's a wonderful local Feta I would encourage people to try. Black Mesa products can be found on the menus of many prominent valley restaurants, sold at many local farmer's markets and on the shelves at specialty stores around town including Whole Foods Market.